'Truant' ( Marky Smith R. 2014) Seedling #09-19TR. BB, 26" (66 cm), Early midseason bloom. Standards mikado orange (RHS 28D) edges, centers orient peach-orange (37D); style arm edges and crest yellow-orange (23C), warm pink midrib; falls. 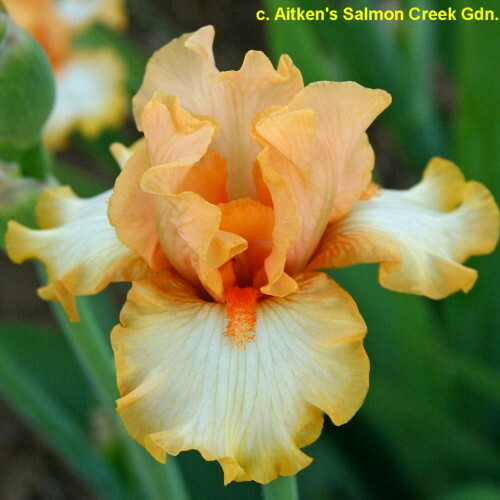 saffron-orange (23B) edge, cream (156D) center with green veining; beards tangerine (33A) in throat, end same tipped cream; ruffled; pronounced sweet fragrance. Seedling #06-16A: (seedling #04-41B, 'Courtesan' sibling x 'Cut Above') X 'Bundle of Love'. Salmon Creek 2015.